Hi dear visitors, today we are posting a cool offer from airtel India. This is for free internet lovers. 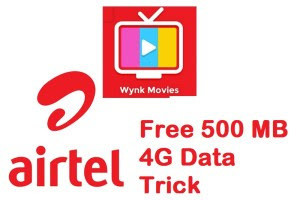 Airtel offering free 500MB 4g data for trying airtel movies. This is a great chance to get some free high-speed internet data from airtel officially. this is not a trick actually, this is an airtel official offer as a part of their airtel movies app promotion. But we have added unlimited trick also here. so that you can earn free internet data on all airtel numbers. You just need to try the airtel movies app to get the free internet data. SO guys if you want free 500 MB 4G data from airtel within minutes then go forward this article. Download the myairtel app. If you already have myairtel app then do update it to the latest version. Now on the main screen [landing screen] choose apps tab. On apps tab, you can see the ‘airtel movies‘ app with the label of ‘get 500 MB free 4g data’. Yeah, congrats. your airtel number is credited with free 500mb 4g data now. you will get a message on successful registration. after successful credit of 500mb free data. goto settings>>apps>airtel movies>>force stop the app and do clear the data [or uninstall the app and install again]. now again go to airtel movies app and register with any other airtel number. you will get free 500 MB data on that number after the successful registration.